Although the Music of Our Time Series has been available for many years, it is still a wealth of valuable repertoire and information. The series consists of nine volumes of piano works in contemporary styles, as well as two volumes of teachers’ guides. 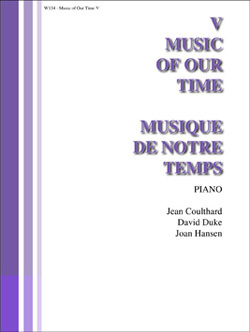 Music of Our Time, Book 5 contains a wealth of repertoire, including these titles: The Rocking Chair (Coulthard); Traffic (Hansen); Renaissance Christmas Song (Duke); Cello Threnody (Coulthard); Invention: The Chase (Hansen); The Happy Photographer (Coulthard); The Unicorn's Pavan (Duke); Waltz (Hansen); Cape Breton Lullaby (Duke); The Haunted Staircase (Hansen); Morning Fog (Duke); Twilight (Coulthard).